Today the postman delivered some good news. 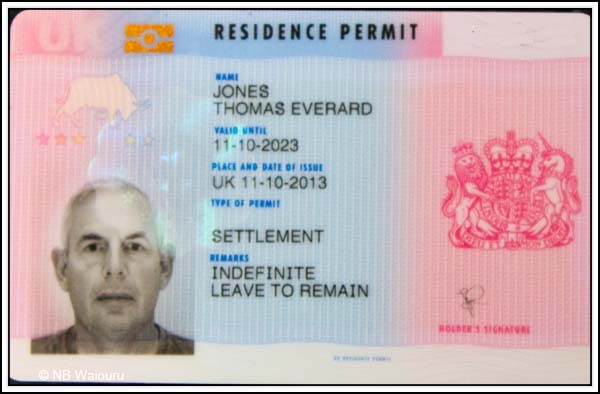 My UK biometric permit has arrived! The accompanying letter also stated I am not required to carry the card at all times but it must be presented to immigration when departing or arriving in the UK. So after two years and £3000 we can finally breath a sigh of relief about our ability to continue our plans for cruising the canals and rivers of England & Wales. Obviously this means I no longer have to hide in Waiouru when we are near major population centres. The software in the new Digital Regulator automatically calculates the equalizing time cycle every time the engine is started. This will range between 1-12 hours depending on the rise time between engine on and time to reach 14 volts; this will be different every time the engine is started, and varies from battery type setting . The internal computer software will look after this function. Furthermore, the Sterling manual stated the high voltage and rapid charging using the PDAR will result in higher than normal battery water evaporation. I can confirm this is correct because we have used five litres of distilled water during our 2013 cruising year. Hence the automatic battery watering system. If the postman delivered it today then I might wonder where it's been since 11th October. Be careful, it may be illegal to post photo of it. The answer has got to be no! I think it's made of edible plastic so I can always eat the evidence! I see it is valid for ten years, does that mean you have to go through the rigmarole again? No, it's indefinite leave to remain provided I comply with the requirements. After 5 years I can apply for citizenship. Well done for persevering and getting it at last.